"There was a time that I thought I was done as a singer. It's devastating." 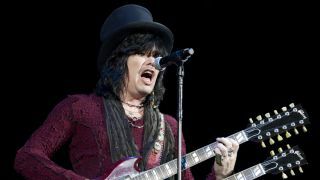 The surprise isn't so much that Tom Keifer has made one whopper of a solo album - although The Way Life Goes certainly is that, a rocked-up, blues and American roots celebration that showcases the Cinderella frontman's most robust batch of original songs to date. It's that he's made any kind of album at all. Since 1991, Keifer has suffered from vocal cord paresis, a neurological condition on the left side of his voice box that almost put an end to a good piece of his livelihood. "When you're a singer, anything that can rob you of your voice is pretty scary," says Keifer. "It's been a long journey from when it all started to where I'm at now, and it's ongoing. When you have what I have, it never really goes away." While treating and managing his vocal cord condition (a process which has included six surgeries), Keifer recorded The Way Life Goes (due out 30 April) during a 10-year-period in Nashville, where he's lived since 1997 ("I moved there for the obvious reasons: the musicians and the songwriters"), working at a couple of commercial studios but tracking vocals and guitar overdubs at home. "This was more of a labor-of-love thing," he says. I didn't work on it continuously for 10 years, but it has been a while in coming. I enjoyed being able to spend time on it and really gain perspective as I worked. You can get too caught up with changing things, though. Sometimes it's better to go in, do it and let it go." In the following interview with MusicRadar, Keifer opens up about his vocal problems, talks about some of his new songs, his beloved vintage guitars and gear and weighs in on being branded "hair metal." How did the situation with your voice start? "It's a pretty long story. The bottom line is, back in '91, when I was on tour with Cinderella, I woke up one day with my voice cracking and breaking. It was literally overnight. Up till then, I had no problems - I just jumped on stage and sang, with no warm-ups or anything. We did five, six nights a week, several tours like that, and I was always fine. "So that started a series of trying to find some answers, until I finally discovered that I had a neurological condition on the left side of my voice box that partially paralyzed one of the vocal cords. It's a subtle thing that you might miss in a normal exam. A lot of doctors didn't catch it. It's a serious condition, though, because a lot of people can never sing again once they have it. "The only remedy is to really train your voice and hope that you can teach it to move correctly again. That's what I've been doing ever since, and I've had my ups and downs, which is another story. I've had six surgeries to repair collateral damage, because I've hemorrhaged my vocal cords because it's so hard to sing. But I've been fortunate to have some great coaches and teachers who have gotten me through the tours and the records I've made." You say that you never used to warm up before singing. Did that contribute to the problem? "This can happen to anybody. Several things can cause it, but in my case it was because of a virus - a bad virus or the flu. If that settles into a nerve, you can have damage. Sometimes it's because of a tumor, but they ruled that out, thankfully. They diagnosed me with viral damage." I remember when Cinderella came out, and one of the first things I noticed was your raspy, screaming style of singing. "Yeah, but that didn't cause it. That kind of register has always felt very natural to me. I listened to singers like Robert Plant and Janis Joplin, and I always felt comfortable going for that higher head-type of singing. The way I sing wasn't the root of the problem at all." So the condition can't be fixed per se, it can only be managed. "Yeah, that's all you can do. Like I said, I've had my ups and downs. Even on tour now, I can be singing great but it'll still feel a little awkward. There's a lot of thought I have to give to singing now. It doesn't flow the way it used to. It really messes with your confidence, so I've been working through that. The more I do tours and shows with it, and I get a better grasp on it, my confidence gets better and better." Were there ever times where you thought, "Oh my God, I'm through!"? "Yeah, sure, there were down moments like that. Just the strain alone and trying to sing with this caused damage, so I've had to deal with that. Like I said, there's been six surgeries. It messes with your creativity and your writing. There were big gaps in what I've done, and this is the reason. It knocked the wind out of my sails in so many ways. For me, the guitar and voice and song are all connected. "There was a time that I thought I was done as a singer, maybe about four years ago. It's devastating. We had to cancel a tour because of it. The best coach I found was the last one, Ron Anderson, and he taught me how to use breath support and how to use the voice in ways I had never done before. Since I've been working with him, it's all been uphill. The voice has gotten stronger and stronger each year." Well, your voice sure sounds good on the new record. "Thanks. I started recording it probably in 2003, so it's been a while in coming. I had a lot of songs stored up. Probably eight years went into the writing. I did all of the recording here in Nashville. The drummer is a guy named Greg Morrow, and the bassist is Michael Rhodes - two killer musicians who do a lot of work here. All of the keyboards were done by Tony Harrell, who plays B3 and Wurlitzers and clavinet. This town is full of amazing musicians. "I did about 95 percent of the guitars, although I did have some guests. There's a guy named Pat Buchanan who did some stuff. He's a killer guitarist. And there's another guy named Gary Burnett. He lives just up the street, so he contributed some things, as well. Oh, and Bobby Keys and Jim Horn played sax. They're pretty legendary guys." The first song, Solid Ground, starts off with a fierce vocal scream. A statement of purpose, perhaps? [Laughs] "No, it just worked out that way. When the band kicked in, I just felt like screaming. It was a spontaneous moment; it wasn't me calling attention to myself. But I do remember cutting the vocal and thinking my voice sounded great that night." Different Light and Cold Day In Hell have such great guitar sounds - the whole record does, actually. Do you have any go-to models that you like to use? "For years, I had my guitars that I always used. I always liked the classics. I have a '59 sunburst Les Paul and a 1950 Nocaster. I've got an old '50s Gretsch Silver Jet and some nice '50s Gibson acoustic. I don't think you can beat those guitars. "In terms of amplifiers, I'm the same way. In high school, I got an early '70s Marshall Super Lead, and it's the kind of amp that has no master volume. You just have to crank it to get the overdrive. It has the thickest, richest rhythm sound you'll ever hear. I got hooked on that. I still play through it - two of them, in fact. When you combine those amps with classic Gibsons and Fenders, there's no sound you can't get. "What's great about those Marshalls is, the distortion is so harmonic and they're so responsive dynamically, they don't compress the sound down to nothing. They really react to your fingers and what you're playing. It sounds as if what I'm playing actually comes out of the amp." Let's stroll down memory lane a bit. When Cinderella came out, the band was lumped in with what we call "hair metal." Did that bother you? "There's two ways that the term was intended: One is kind of reminiscent of the era, and another is maybe 'all hair and no talent.' The last one I take issue with. Them's fightin' words. [Laughs] The phrase came about because of the look of the times, and the hair was very over the top - I get that. A lot of the bands from that time, including us, grew up with '60s glam rock stars, so those were our influences that we took from. I always loved Bowie and the Stones and Janis, but I loved Lynyrd Skynyrd and the Eagles, too." You guys did that whole swinging-the-guitar-around-your-neck-and-catching-it trick. Did you ever break any guitars doing that? [Laughs] "I didn't, no. Actually, Jeff and Eric were the ones who really did that. When we were in the clubs, I attempted it. I think I hit myself in the head and never did it again [laughs]. But those guys are masters at that. They did hurt themselves, though, and I think there was a strap that broke and a guitar went flying. They still do it, too. They haven't missed a beat."